Original to this location was a wooden framed structure that had housed various businesses, most recently that of Fred Bradbrook. He had come to Red Cloud in 1883 and established a photography studio known as Bradbrook’s Fourth Avenue Studio. An 1886 issue of The Red Cloud Chief informs the readers that John H. Kellogg & Co. have new plans for this area. 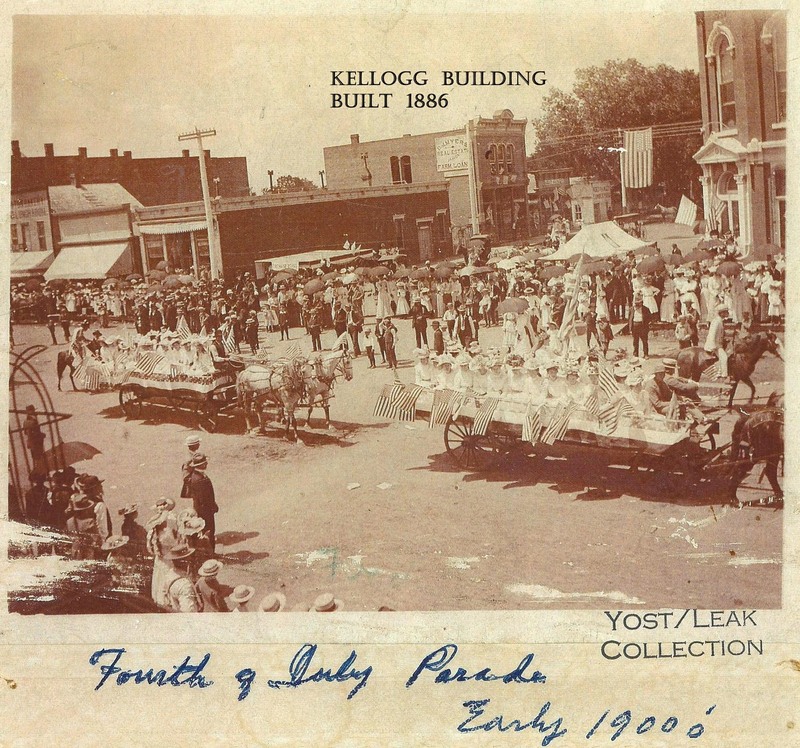 Only having intentions for the land, Kellogg sold the frame structure. The purchasing parties moved it to the lot directly west to use as a meat market. These actions also precipitated Bradbrook to temporarily relocate his business. He moved his studio one-half block west to the northwest corner of West Fourth Avenue and North Cedar Streets. The newspapers often referred to him as “Brad,” Red Cloud’s popular Fourth Avenue artist. 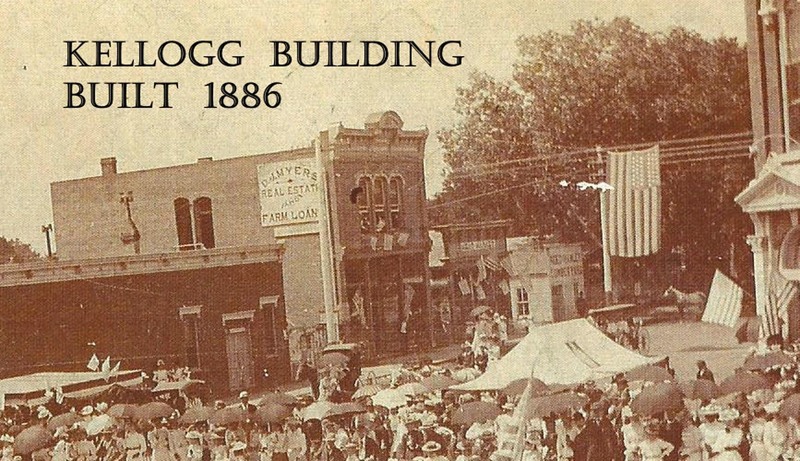 A July 23, 1886 issue of The Red Cloud Chief reports that Kellogg & Co. are at work excavating for a two story 25’ X 50’ brick structure. An August issue states that work has begun on the foundation. Located at the rear of Sherer’s City Drug Store, the building was to have a plate glass and iron front and would face north to Fourth Avenue. Kellogg’s plan was to use the main floor as a post office and fit up the second story for a photography studio. These intentions were further evidenced by the spacious sky light that was a planned feature of the upper level. The second floor was accessed by an exterior stairway. Once the build was complete, the post office took occupancy of the first floor and Bradbrook returned his studio to its planned location on the upper level. However, when a spacious studio area became available on the second floor of the Moon Block (west side of the 400 block of Webster St.), he relocated there. The move was reflected in the labeling of his photo blanks from Fourth Avenue Studio to Bradbrook’s, Moon Block. Bradbrook is credited with photographing hundreds, possibly thousands, of subjects and events during his relatively short time in business. He was afflicted with lip cancer in 1903. After aggressively seeking treatment and thinking that it had been eradicated, he and the whole community were dismayed when they learned that the disease had returned. “Brad” died in 1906 at the age of 55. His wife, the former Theresa Egghoffer of Blue Hill, and two sons, Lloyd and Guy, survived. Following the photography studio’s relocation, D. J. Myers established his insurance and real estate business on the second floor of the Kellogg Building. A painted sign on the exterior of the building is visible in many photos of the building. Sanborn Fire Maps of 1892 and 1897 confirm the building’s continued use as a post office but their 1905 maps indicate that the space was then occupied by a meat market. This is assumed to have occurred by 1902 as a photo shown in the Webster County Argus’ publication, Scenes in and Around Red Cloud, documents Earl R. Sherer in the Post Office Meat Market at that location. 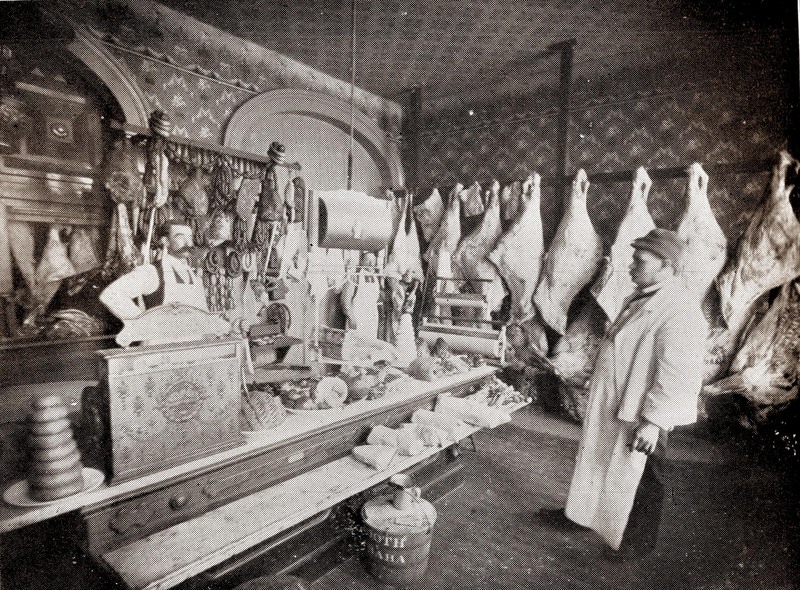 Meat markets and grocery stores operated as separate establishments at that time. Some local meat markets and grocery stores united and began serving Red Cloud patrons under the same roof sometime in the 1950’s. John E. Yost and Sons Meat Market, 1922 Harry, John, & Levi Yost, with Charles Eggleston, employee. The man seen in the mirror is Jake Ellinger, a family friend and local auctioneer. 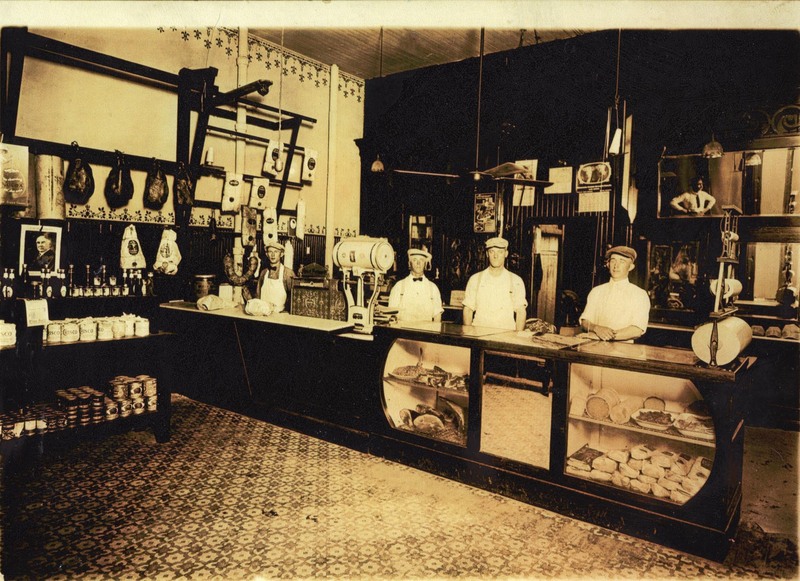 In July of 1906 John E. Yost joined Wisecarver in the meat business at this location and later partnered with John Havel followed by James L. Butler in the same until becoming the sole proprietor. John also raised and bought stock for his business as well as raising and buying stock for the purpose of investment. 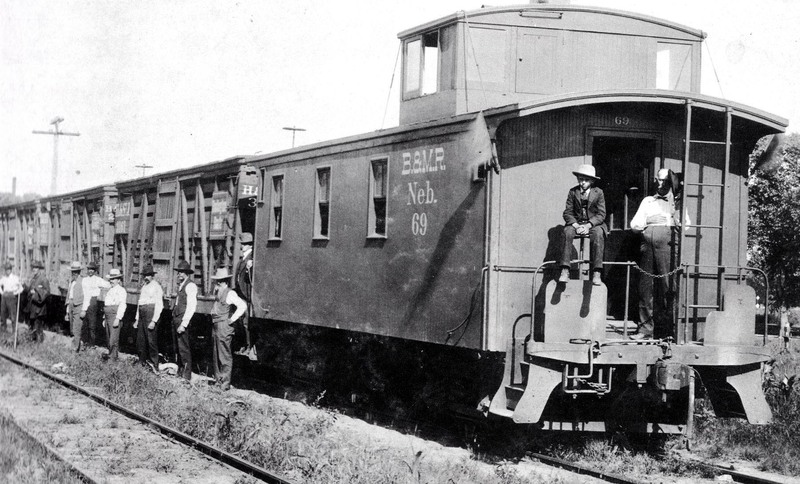 The latter were shipped by rail from Red Cloud to what were referred to as the river markets. These referenced Omaha, Kansas City, and St. Joe. As was common with such an endeavor at the time, many owners accompanied their stock to market. Most of the stock shipped from Red Cloud left the depot on Sundays. While a young lad of 12, Harry, John’s oldest son, joined his father in the business after school hours. Using his pony and cart, Harry delivered the day’s orders to their customers who had shopped in the market earlier that day or had dialed number “52” and placed an order to be delivered to their home. Many housewives or female household employees walked to town to shop for the family. This necessitated the businesses to deliver the patrons’ purchases to their homes. Deliveries were also made to the restaurants and lunch rooms. John’s younger brother, Levi, also bought into the business for a short period of time in 1918. This precipitated the name of the business to change from Fourth Avenue Market to Yost Bros. Market. Shortly after returning from his service in World War I, Harry, took an active role in the family enterprise when he bought out his Uncle Levi’s half interest in the business in February 1919. During the years before more extensive refrigeration was found in homes, it was necessary to be open seven days a week. The Yost’s butchering occurred on the family farm located just beyond the northwest edge of town. An imprint of the building can still be seen today. This was created by the salt that was used to preserve the hides until they were sent to the tannery. In July of 1927 Harry purchased his father’s remaining interest. Later that same year, the firm was asked to dress a buffalo for a special community event. John continued to help in the market until sometime in 1939. Prior to moving to California in the 1930’s, another one of John’s sons and half-brother to Harry, Lester Yost, was also an employee of the market. A serious medical condition forced Harry into early retirement in 1946 at the age of 52. During the Yost family ownerships of the business it was known as Fourth Avenue Market, Yost Brothers Meat Market, J. E. Yost and Son Meat Market, and Yost Meat Market. 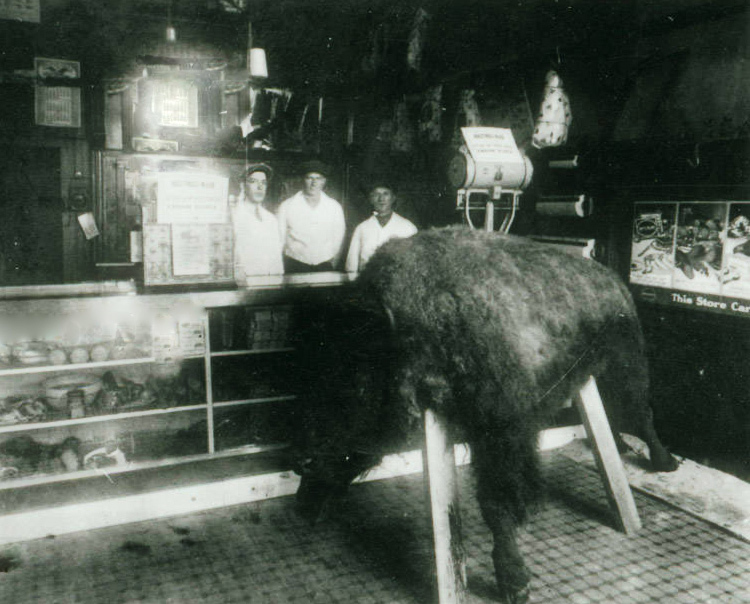 Employees, Albert Soderlin and Herman Medlen, and owner, Harry Yost, are shown with the hide of the buffalo they dressed for a special event in 1927. Following Harry’s untimely retirement, the building and business were sold to Herman Medlen, a longtime employee of the Yosts. Guy McCarty purchased it from Herman and continued to operate a meat market from this location. Later, Don Worman used the main floor of the building for his barber shop. Taylor Rexall Drug owned the building and used it as storage facility until Dr. Amy Springer purchased it from the Taylor family. Dr. Springer purposed the main floor for her stained glass studio and utilizes the second floor for her residence. After hours of calculated and painstaking labor, the diligent doctor uncovered the stenciling on the walls that was shown in the 1922 Yost Meat Market photo.